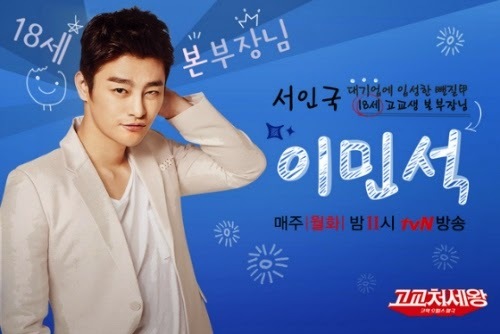 It was recently reported that Seo In Guk, who’s currently acting as Lee Min Suk in my favorite drama right now ‘King Of High School Life Conduct’, suffered a shoulder injury while filming an ice hockey match. Seo In Guk visited the hospital then returned to the set of the drama to continue filming despite being injured. Just hearing this makes me heart-broken and sad because I mean, come on, it’s Seo In Guk! He got injured, but still returned to the set to keep filming. He’s such a determined kid who’s passionate about acting so there’s no doubt that I’m very proud of him for being persistent and hard-working. And I don’t get how one could hate him after watching ‘King of High School’ AKA the best Korean drama airing right now (IMO of course). I hope he’ll make a fast recovery so that filming and other physical activities will be easier for him. Seo In Guk Hwaiting! Mary, I’m following Marriage, Not Dating too, so if you recap it, I will surely read it. No doubt! I had a crush on Yeon Woo Jin from the days of Ojakgyo Brothers! But, but, my crack drama right now as you know it is King Of High School! Your recaps and screen captures for that are fab! You must have put in great effort to do that (I appreciate it very much, thank you very kamsa!). But I think if you do it out of love, it’s not so bad, right? I mean, you’re likely to remember the awesome scenes; they’d replay in your mind on their own anyway, right? Yes I’m watching. Please recap! I am loving Marriage Not Dating and would read your recaps. However, be aware that the tvn and Viki eng subs are appearing very fast. One reviewer, whom I admire very much, has summaries which are at odds with the official subs. It is leaving me a bit confused. I am interested in the lines the subbers leave out ( they can be so revealing) or how some of the action is embedded in Korean culture. Perhaps that is where you can make a big difference.